Product Info: For more than 60 years, the JBL® brand has been helping musicians sound their best for audiences large and small. Now we’ve teamed up with Quiksilver® sportswear to help your favorite artists sound their best for you – and you alone. 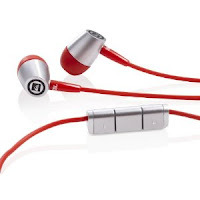 Quiksilver Snow JBL in-ear headphones deliver all the sonic realism and deep, distortion-free bass you’d expect from the world’s leading professional audio maker with all the style you expect from the Quiksilver brand – in compact, folding headphones that can go with you anywhere. This is not the first set of earbuds I've recently reviewed. The other pair retail for about a fifth the price of these and had the same wretchedly echoing quality in the device these were designed for. That said I found these were amazing hooked into my computer. I didn't want them for that, but my iPad so if I had bought them for myself I would be returning these. Two things I wanted to note about these that may be important to other customers is that the cord on these isn't very long and the 'white' is more of a silver. These are very comfortable, love the inline 3 button remote system, it's a nice touch and well located. These are also incredibly light and fit nicely into the included case which is very protective. On the whole these ARE an excellent set of earbuds but didn't impress me in the intended Apple devices they were designed for. I think next time I'll opt for an on-ear headphone set in spite of the bulk, maybe that will prove to be less tunnely and flat sounding. Notes: Product received for review via Amazon Vine.